The 2nd Sustainable Innovation in Sport is going to be held on 22-23 February, 2017 in Munich, Germany – a 2 day meeting bringing together stakeholders and influencers who are engendering positive environmental impacts through sport. This event follows a highly successful first edition of Sustainable Innovation in Sport 2015 which took place during COP21 in Paris. We are glad to inform you, that we are going to be there in order to inform you about the latest news and developments in sport and sustainability! This two days meeting will deep dive into the economic, political and societal opportunities that enhancing sustainability in sports can offer to stakeholders in the industry, will amplify and bring awareness to current initiatives that are changing the face of the international sports and sustainability space, as well as focus on new policy and technologies that can be significant game changers. One of the major ecological problems we are facing today is the enormous amount of garbage we generate each day. Every new creative idea, not matters how small, that helps to fight against this problem is very useful. 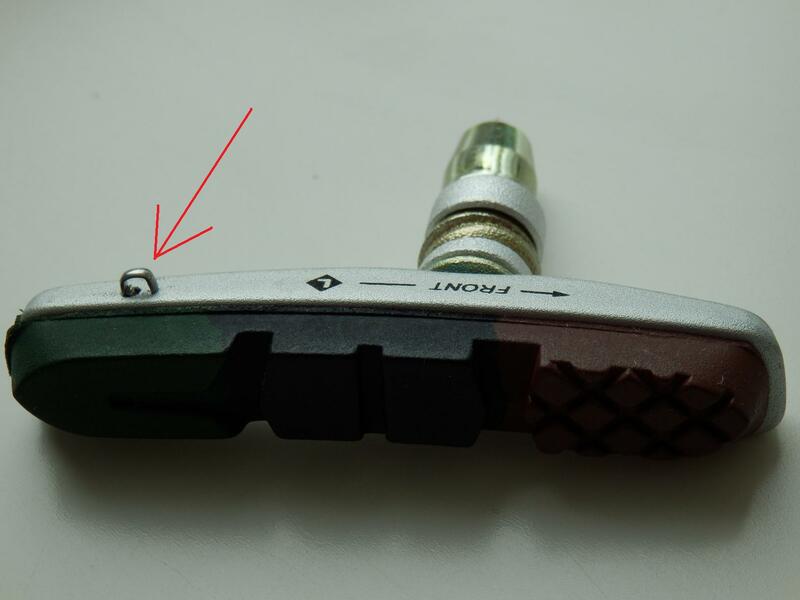 All those who use the bicycle frequently, and have “cantilever” type brakes (also called V-brake), know that the brake pads (also called shoes) have to be changed with relative frequency. And this is where we link to the beginning of this entry, because each change of pads are thrown away small metal parts, and as this type of brake is still widely used around the world, a huge amount of metal parts end up in the dump each year putting extra strain on the environment. 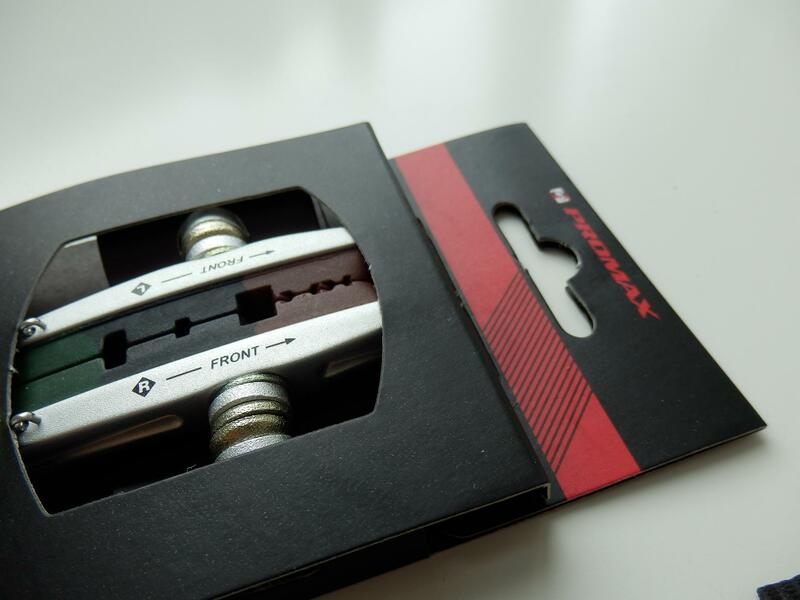 Californian company Promax has developed a solution to this problem: interchangeable rubber parts for the pads. When the rubber is worn out by use, it can easily be replaced without having to pull any of the metal parts. The pair of pads costs the first time about 12.90 € and the rubber spare parts about 6 euros (prices in Berlin, as of October 2016). 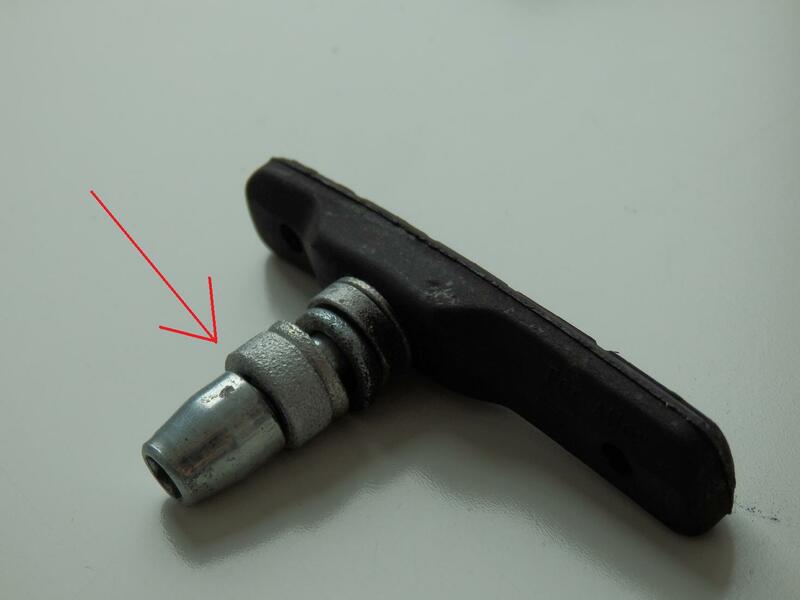 In the lower picture I marked with a red arrow the small hook that allows to easily release the worn rubber, to be able to replace it with a new one. This simple example is a small sample how to put little by little our bit can contribute from the sports equipment sector to improve problems that affect us all as in this case excessive garbage generation. This simple example shows how we and the sporting goods industry can make a contribution to solve problems that affect us all, as in this case excessive garbage generation. An old African proverb I have always liked says: many small people, in small places, doing many small things, can change the world. Do you know of another example that you want to share with us? 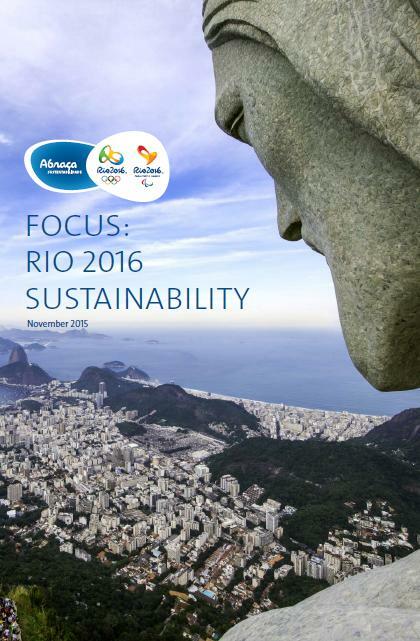 Just a few months before the start of the Olympics, we have increasingly more information about the Sustainability Management Plan that the team led by Tania Braga (Head of Sustainability) has launched for Rio 2016. • People – “Games for all”: Involvement and awareness, universal access, diversity and inclusion. • Planet – “Reduced Environmental Footprint”: transport and logistics, environmental conservation/clean up, sustainable design and construction and waste management. • Prosperity – “Responsible and transparent Management”: responsible and transparent management, sustainable supply chain, management and reporting. These 3 “P” (People, Planet and Prosperity) represent the three dimensions of sustainability: Society, Environment and Economy. Concerning the economy, the organizing committee has a budget of 7,4 billion reais (about 1,8 billion euros) but the total budget for the Olympics, including infrastructure investments, amounted to 37,7 billion reais (about 10 billion euros). By comparison, the World Cup in Brazil 2014 cost about 13,3 billion euros. In any case, we have to wait to know the final figures, because an interesting study from the University of Oxford which was published in 2012 (“Cost and Cost Overrun at the Olympics 1960-2012”), shows that on average, Olympics end up costing 179% more than budgeted when nominate. Organizing an Olympic Games is primarily a logistical challenge. By its own estimates, the organization needs to buy and rent some 30 million items, and during the Games will be served 14 million meals, which will mean some 6,000 tons of food. If when buying these foods or objects, we take into account environmental and social aspects, in addition to the economic cost, we can get an idea of the difficulty of the task. For this, the sustainability team has published a detailed guide: “Sustainable-Supply-Chain–Guide”, which establishes sustainability criteria that are taken into account, both for purchase and for the “sponsoring”. • Wood and Paper: Brazil is a country of “florestas” (forest), so all timber products and derivatives are to be produced from raw materials 100% recycled, or they must be certified (for example, by the FSC). The needs are also huge: only to cover the entire surface of the track of the Olympic velodrome, are 92 m³ wood required. • Packing: “whenever possible”, the material used for packaging products must be recycled and recyclable. This statement, which sounds vague, is accompanied by the requirement that suppliers comply with the guidelines of the Brazilian National Waste Management Agency: avoid, reduce, reuse, recycle, etc. They have also published a detailed guide on the subject: Guide-for-Packaging. • Food: providers must adhere to the commitment “Zero Deforestation” trying to prevent, for example, that meat comes from animal farms where have destroyed the Amazon rainforest. An partnership with the Marine Stewardship Council (MSC) and Aquaculture (ASC), “so that suppliers may obtain sustainable certification for fish and seafood” is also established.This is also not very concrete, since the organization is not committed to buy only seafood certified by the MSC, but have signed an agreement to support more sellers certify their products. A curiosity: food will generate 80% of all waste to be produced during the games. • Working conditions: Suppliers and sub-companies must ensure that the working conditions of its workers meet the minimum standards from the “Code of the Ethical Trading Initiative (ETI). A cooperation with Sedex Global is also established, a nonprofit organization specializing in the development of global supply chains that respect the rights of workers. They have a online platform that allows buyers and suppliers to learn about social standards from possible suppliers. According to the calculation made by the organization, about 3.6 million tons of CO2 equivalent¹(e) is the total emissions attributable to the whole process of organizing the 2016 Olympic and Paralympic Games. This is equivalent to the emissions generated for 32 million mobile phones during a year. The city of Rio generates annually 25 and a European city like Berlin 20.7 million tons of CO2e. The travel of spectators to attend the event will be the cause of most of these emissions. The reason: it is estimated that 15 per cent will be international visitors, who mostly travel by plane, but also because due to the large size of Brazil, many of the visitors to the country itself will also use this mode of transport. London 2012 spectators’ travels did not generate as much emissions as expected in Rio 2016, mainly due to its central European location. 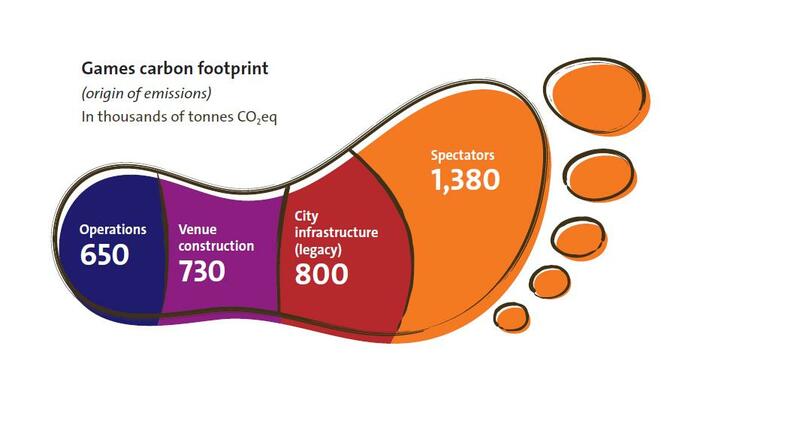 However, in the British capital it was necessary to build more sports facilities than in Rio, and this was the most important factor of emissions production. • Avoid and reduce emissions through careful and early planning. 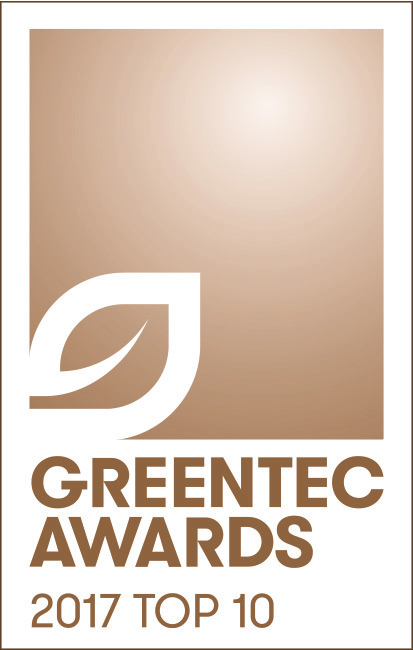 Use of materials and products with a low carbon footprint. • Replace fossil fuels for renewable and alternative fuels, such as ethanol, or whenever possible to use electricity. • Compensate unavoidable emissions by investing in projects for climate protection. To this objetive a cooperation with the DOW Chemical company is established. In Brazil, 45.3% of the total energy and 85% of electricity comes from renewable sources, mainly thanks to hydropower. This influences in a very positive way in reducing the carbon footprint. By comparison, in Spain (2014) 14.5% of primary energy and 39.5% of electricity comes from renewables. • Guanabara Bay: here are scheduled different Olympic events, including sailing and open water swimming. Unfortunately, the bay has become famous for the major water pollution. It seems unlikely that in the short time remaining the water quality can meet the desired standards. • Where is the legacy of the World Cup 2014? I read in one of the documents “For the 2016 Games, the area adjacent to the Maracana Stadium will require large-scale urban renewal“. And then I wonder: how can it be that two years after the World Cup and an investment of 15 billion US Dollar, they have still to renew around the Maracana Stadium, which was where the final was held in 2014? • Sponsors such as McDonalds: this multinational is not particularly known for their commitment to sustainability, therefore, I wonder if is consistent to accept the financial sponsorship of any company, regardless of what the company policy is. The current trend is clear. Sustainability is one of the criteria that increasingly has more weight when making decisions in the organization of the Olympic Games. The challenge lies of balancing sustainability with other key issues such as cost, quality, deadlines, risks, etc. The Rio 2016 organizing committee has already received international certification ISO 20121 (International Standard for Sustainable Event Management), which indicates that they are on the right track. I appreciate very much, all the information about this topic, that the organisation until now has been published. * Sources: all documents on sustainability in Rio 2016 can be found HERE. I have obtained all information and graphics for this post from these documents. 1) CO2 equivalent (CO2e) includes not only carbon dioxide, but all produce greenhouse gases. Now that we are in full winter season, it’s time to enjoy the snow with sustainable sports such as ski mountaineering and cross-country skiing. Having well-waxed skis is essential to slide properly, or to “grab” the snow in the case of classical cross-country skiing, and thus increase the fun and performance. -Cold waxing: stands very little time, just a few rundowns, as the wax is not well placed into the sole of the ski / board, and quickly disappears with the friction. They are used for specific times and often sold in boxes with applicator, like cream for shoes. -Hot waxing: solid waxes (block or powder) are used and therefore we need an iron that allows us to melt them with the aid of heat, in order to apply them properly. It is a wax that lasts long, and deeply hydrates the material as the liquid penetrates better into the sole. As you have seen, the wax we need for “cold” or “hot” waxing are different, and within these two categories there are also a wide variety of waxes for different types of snow that we can find, from a very cold snow powder (-15 to -30ºC), to a more wet snow with more temperature (-5 to 0ºC). Perhaps you ever wondered what material are these waxes made from. The vast majority of them are made of paraffin, a petroleum derivative, and very often are added additives such as fluorine, to repel water better. Today we find even “highly fluorinated” waxes, which initially were used only in competition, but that over time have arrived to the public. Unfortunately, the addition of fluorine is achieved by perfluorocarbons or PFCs. PFCs are a family of chemical compounds and because of their links carbon and fluorine, they have a peculiar physical properties: waterproof, non-stick agents, fire retardants, etc. Unfortunately, these chemical bonds are so stable that they are hardly biodegradable, which makes them potent and dangerous pollutants. We have already commented, that on every run down the slopes bits of wax flake off skis and snowboards. When snow melts, the residues of wax get together with water and they become part of the groundwater or rivers. Now imagine what happens to the water quality of these rivers, that they also carry water to our homes, if the thousands of skiers are using waxes that contain pollutants such as PFCs, which are bioaccumulative and hardly biodegradable. Although only a few grams of wax on each visit are left, we have to keep in mind that each year more than 300 million visits occur at ski resorts worldwide. It is therefore not surprising that Greenpeace in its latest study has found traces of PFCs in “remote areas” of the earth. The other major problem we found with these fluorinated waxes would especially suffer the professionals ski wax technicians who spend hours waxing and taking care of the skiing material, because when fluorocarbons are exposed to high temperatures, toxic fumes are released. If you have tried to hot waxing with an iron, will have had the experience of seeing how some fumes are released during the process, which do not smell particularly well. Wearing a mask, protect your eyes and be in a very well ventilated it is essential to work with this type of wax, but still, this does not guarantee complete protection of health as several studies * have warned. But not all are bad news, because fortunately we have greener alternatives. 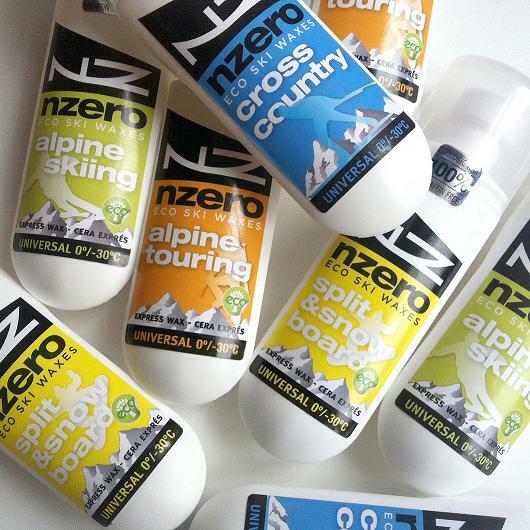 A Catalan company in Spain with the name of NZero offers waxes made from plant extracts, PFCs- and paraffin-free. -100% vegetable waxes: all waxes are made with 100% natural ingredients. The base is a mixture of soya, maize and natural extracts, without the addition of toxic additives. -0% paraffins and fluorine: these products are 100% free of hydrocarbons, paraffins and other contaminants. -0% toxic vapors and fumes: the hot wax produce fewer emissions, and the same are not toxic. Congratulations to NZero for this innovation, which not only takes care of our material, but also the environment and our health. Learn more about this company. * For more information on the subject, I leave here an interesting article. One of my favorite sports is Sea Kayaking. It is a quiet and eco-friendly sport, takes place in a context of great beauty and is also an exceptional training … What more could you ask for? My brother and I are usually going on short kayak trips during the summer along the Alicante coast, and unfortunately we collect more and more plastic bags floating on the sea. I feel that this type of pollution, far from diminishing, each year gets worse. Curiosly, returning the other day on a train from Berlin, I read in a magazine an article about the “Grüne Helden 2015” (“the 2015 environmental heroes”). The article described the most important initiatives during this year, that many people started in different parts of Germany, to help improving the environment. One of the protagonists caught my eye immediately with its original project “Clean River”. The author is called Stephan Horch and his passion is kayaking on rivers. Stephan started collecting plastic waste that he found during his paddling trips. As he is a graphic designer and artist by profession he thought, before throwing the garbage into the container, to photograph it in an artistic way to draw more attention to this problem. What as an altruistic action of a kayak-fan began, became shortly after on a project with great media and on social networksimpact: thecleanriverproject. In September he’s just completed his first successful crowdfunding campaign to finance a multi-day adventure trip on the Rhine, including exhibitions of his photos in some citys during his trip, in order to raise awareness on the problem of plastic pollution in the nature. > Avoid using plastic bags, plastic packaging and disposable products as much as possible. > Avoid toothpaste and cosmetics containing micro-plastics. > Avoid products that contain PVC (polyvinyl chloride). > Throw the plastic waste always into the right place for recycling or for the appropriate treatment. I add one last proposal: actively learn how to live without plastic, and some websites to consult it as interesting as: Zerowastehome. In 2011 the ski resort Sonnenplateau Mieming in Tyrol had the courage of going for a more sustainable winter tourism and dismantled their ski-lifts. After much discussion, the idea of ​​positioning as a tranquility place finally prevailed, away from the circus of traditional ski resorts, and oriented primarily towards families and nature lovers. We must also say that the maintenance of lifts involved an annual cost of 200,000 euros for the municipality and the tourist association, and they were so out-dated that an investment of 5 million* euros for renewal were required. Furthermore, the global warming is knocking on the door, the overall number of skiers stagnates for years and a there is a very tough competition with other bigger ski resorts. It was the time to find a new tourism strategy. While this does not detract the courage to shift from the traditional established paradigm. A ski resort in Tyrol within 60 km from Innsbruck without ski-lifts? A winter tourism without alpine skiing? Will they tourists keep coming? 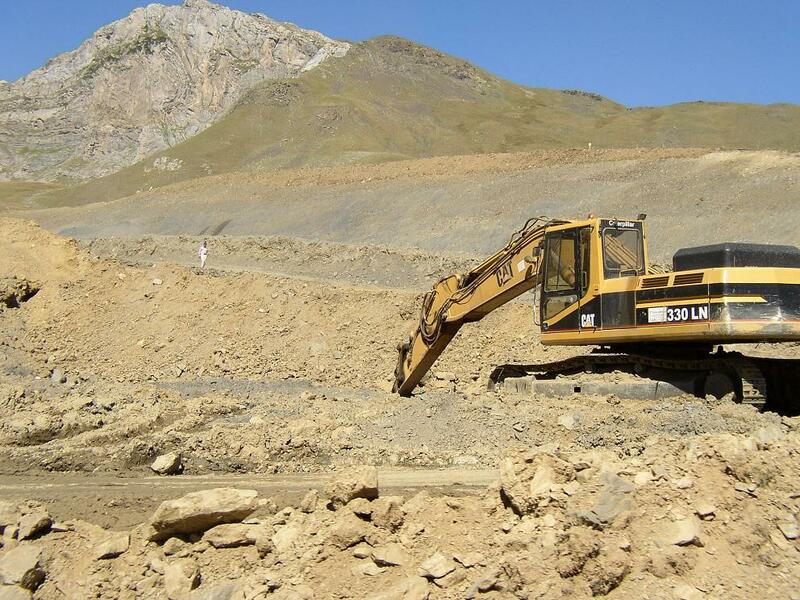 Photo: Formigal ski resort enlargement project 2004. The traditional strategy of the ski resorts: more and more ski domain … And what about the environmental cost? Once disassembled the ski lifts, the municipality began to promote itself as a different place without mountains sewn with cables and away from the bustle of downhill skiing. The activities on offer are: cross-country skiing and ski touring, snowshoeing, winter hiking, sledging and one “Kinderland”. This Kinderland, which reinforces the offer for families, is a place where children can play in the snow and learning to ski using a ski lift conveyor. Photo: Plains Hospital, Benasque. 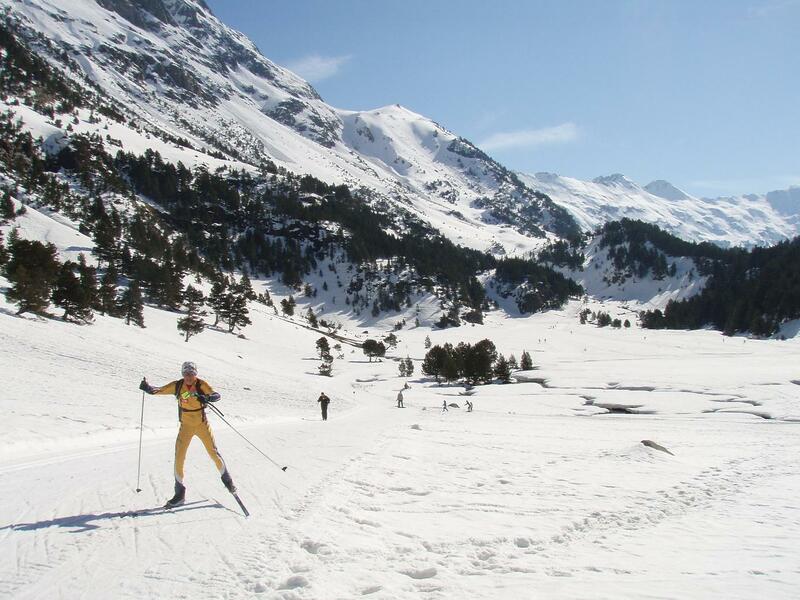 The cross-country skiing and ski touring are much more sustainable sports than alpine skiing. The first winter season without lifts was poor, some hoteliers say they were 20% less occupation. The second season 2012/2013 was much better and the 2014/2015 season have already been achieved occupancy levels they had before removing the lifts*. It has also changed the type of customers, tourists who prefer to meet a deer in the woods while walking with snowshoes, to an endless line of skiers waiting to take the chairlift. Families with children and older people are the visitors that have increased. In addition, the municipality no longer has the economic burden which meant the maintenance of the old facilities and the beautiful surroundings has greatly improved without the lifts towers and cables. This improvement is especially noticeable in the summer months, attracting more tourists. Fortunately there is a ski resort that focuses on a different marketing and breaks with the traditional model of offering more and more ski domain, regardless of the environmental cost. Fortunately someone dares to show that you can offer a much more sustainable snow tourism, and the tourists keep coming. Fortunately someone dares to have new ideas and rejects very expensive investments in ski-lifts that, in the end, they become “white elephants”. But perhaps the greatest difficulty is to have new ideas, to break old paradigms and to try it out. Werkstatt N is a quality seal awarded by the Rat für Nachhaltige Entwicklung, (“German Council for Sustainable Development”) to ideas, projects and initiatives show the way to a more sustainable society. The German government launched and financed this Council since 2001. It is a pleasure for me to share with you that this website and the project “sustainability and sport” just received this seal of quality and have been chosen “Project N-Werkstatt 2015”. A jury of that Council has awarded the 100 best projects for 2015, among 250 candidates. Thank you very much to all for your visits! Click here to follow this blog and receive notifications of new posts by email .